Last week, Professor Matthew Weait presented this excellent paper at The Future of European Prevention Among MSM Conference (FEMP 2011) in Stockholm, Sweden. I'll also quote from the introduction here, but the entire paper is a must-read, and can be dowloaded here. The European region is suffering from an epidemic of criminalization. Across the continent, people living with HIV are being investigated, prosecuted, convicted and imprisoned for non-deliberate HIV exposure and transmission. It is an epidemic that is causing significant harm: not only directly – to the people who are being subjected to harsh and punitive responses – but indirectly, to efforts aimed at normalizing HIV and reducing stigma, to HIV prevention work, and to attempts to affirm the importance of shared responsibility for sexual health. It is an epidemic whose impact is felt especially by people who already experience particular social and economic exclusion and vulnerability. 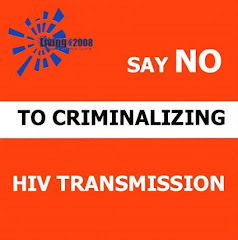 It is an epidemic that has created, based on UNAIDS HIV prevalence estimates for 2009, some 2.2 million potential criminals in Western and Central Europe. It is an epidemic that we have to respond to collectively, and which for we have to find a cure. In this paper I will do three things. First, I will provide an overview of the scope, extent and distribution of criminalization in the region, and in doing so to emphasise the disparities that exist and the problematic consequences of these disparities for PLHIV. Second, I will discuss what I understand to be the reasons for criminalization, and its variation across countries. Third, and bearing in mind these reasons and variations, I will discuss some of the responses which civil society organisations and others have been making to criminalization, and at additional interventions we might consider exploring and developing. The paper is especially timely given important developments in Switzerland and the Nordic countries, where law reform is ongoing in Denmark, Norway and Switzerland, and civil society advocacy moving towards law reform is taking place in Finland and Sweden. 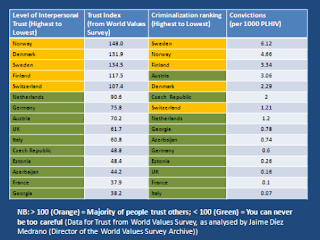 One of the most interesting aspects of Prof. Weait's paper is that he finds a correlation between attitudes towards interpersonal trust and the high per capita conviction rates in the five countries mentioned above, which helps explain why the criminal law's approach to HIV in these countries focuses on public health rather than human rights. These correlations between interpersonal trust and conviction rates in the region become even more interesting when we learn that, according to reliable empirical research, the Scandinavian countries have a lower fear of crime, are less punitive in their attitudes to those who commit crime, and – in general – have lower rates of imprisonment for convicted offenders than other countries. If this is the case, why would HIV transmission and exposure criminalization be so high? My answer to this is tentative, but it seems plausible to suggest that the sexual HIV cases that get as far as court and a conviction are ones which are paradigm examples of breach of trust. It is not inconsistent for a society to have a lower than average generalised fear of crime, or lower than average punitive attitudes, and at the same time to respond punitively to specific experiences of harm, especially when that arises from a belief that the person behaving harmfully could have behaved otherwise and chose not to. Indeed, it seems entirely plausible that where there are high expectations of trust, breaches of trust (for example, non-disclosure of HIV status) are treated as more significant than where value in trust is low. Combine this with countries (such as those in Scandinavia) which are committed to using law to ensure public health, and which consequently are prepared to using it to respond to the risk of harm (HIV exposure), as well as harm itself (HIV transmission), and we can see why the pattern of criminalization appears to be as it is.